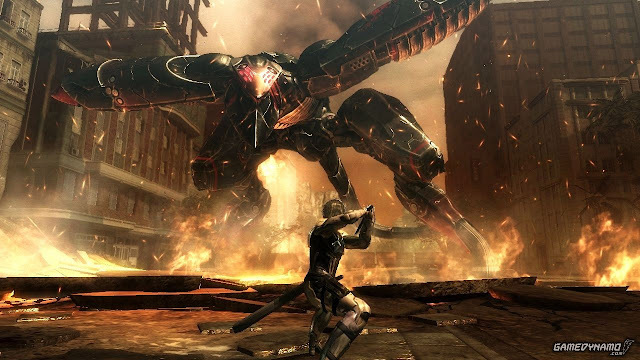 Metal Gear Rising: Revengeance is an action hack and slash game developed by Platinum Games. This is a spin-off game set in the Metal Gear universe that may or may not be canon. You play as Raiden, a cyborg ninja and former child soldier from the Metal Gear games who's entire body is mechanical except for his face. 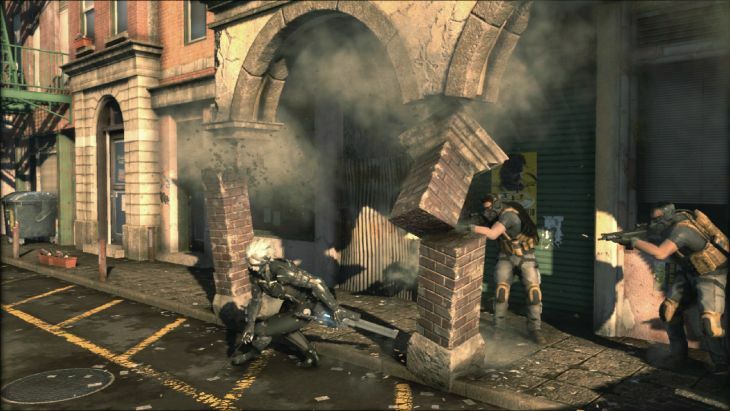 After the events of the main line Metal gear games, Raiden is employed by a private military company that provides security. While working as security for the president of an unnamed African country, their convoy is ambushed by a cyborg military group called Desperado, the strongest members of this group call themselves the "winds of destruction"
They kill the convoy and the president that Raiden tried to protect. Raiden fights a member of the Winds of Destruction named Jetstream Sam. Raiden is almost killed in this fight and loses and eye and an arm. He is reconstructed and given an upgraded and much stronger body in order to fight the members of this group. Raiden, with the help of his support team Kevin, Boris and Courtney. The rest of the game is about fighting Desperado and killing the Winds of Destruction members. Raiden loses an arm again. 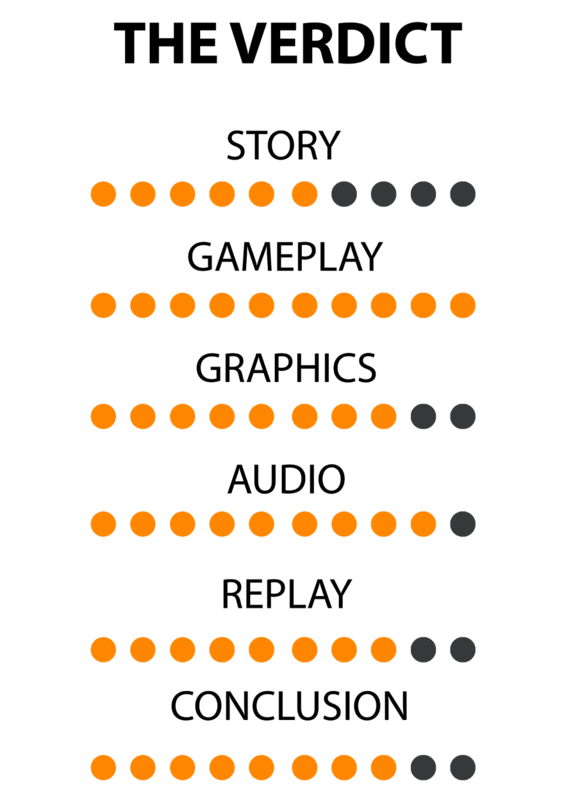 Platinum is not known for their storytelling ability, the story in Platinum games tends to be fairly weak. The only reason this game's plot succeeds is because it uses Metal Gear's pre-existing story and adds a new, self-contained section to it that may or may not be canon. The gameplay is so much fun as it's one of the few hack and slash games where your weapon actually feels sharp and deadly. Too many games have a weapon that doesn't do much other than cause a slight stagger and some blood spray. Metal Gear Rising does something unique with it's combat that is designed to reward you for pulling off combos and playing well. 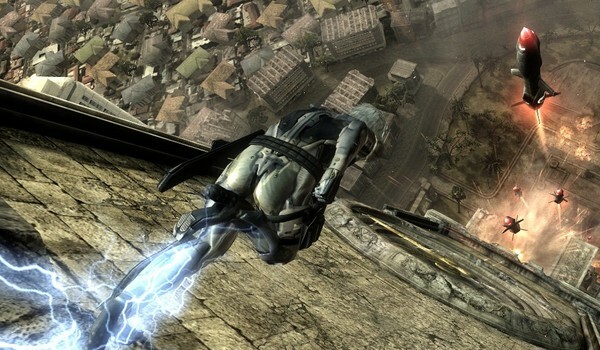 That feature is the blade mode mechanic, this ability slows down time and allows Raiden to cut enemies into hundreds of pieces with speed and extreme precision. You can cut enemies wherever you like, you can cut off a single limb and watch the enemy crawl, you can cut their head specifically in to hundreds of pieces, or you could simply slash once down the middle and cut them completely in half. The freedom is yours! This ability is also used throughout boss fights and larger enemy encounters, which makes combat feel so rewarding and fun. The environment can be cut in many areas to kill enemies, such as cutting the supports on a bridge to make it come crashing down on an enemy. Having options like this can create some fun moments. Raiden's new body can use enemy nanomachines to repair itself, to get to these nanomachines you must cut the enemy open with blade mode and then pull out their spine and crush it in your hand. This is called Zandatsu, which means "cut and take". It is a core mechanic of the game and will be needed in group fights where you are surrounded. Blade mode used on a car. Raiden has a huge number of unlockable moves and alternate weapons earned from killing bosses. He hits very fast and there is no stamina bar to hold you back, if you're good enough to can lock enemies in to combos until they're low on health and then use blade mode to shred them. You will often be forced to fight multiple enemies that will attempt to swarm you, thankfully the block and dodge are really good and can be spammable. Raiden's body will make enemies flash before they attack, which is your cue to block or dodge. Blocking has no cooldown and is immediately usable again after blocking a hit. You have tons of moves to play around with that all feel useful and satisfying to pull off. Combat while ripper mode is active. Raiden unlocks ripper mode later on in the game and can cut through enemies like in blade mode by using normal attacks, but it uses a resource bar that quickly runs out and must be recharged. The boss fights throughout the game are fantastic as every boss fight is unique and manages to one-up the previous fight in some way. The tutorial boss is a Metal Gear Ray, which was a final boss from mainline Metal Gear games. Raiden picks the giant machine up and then throws it while music with vocals kick in. The other bosses tend to use a cool mechanic and then take it extreme, such as a boss that has a magnetic body that can't be cut because it can just move out of the way of your blade, the same boss can also make a giant spinning blade out of tanks, helicopters and vehicles held together by magnetism. Each boss fight is goofy, over the top and exciting. The fights are brilliant and are one of the best parts of the game. Normal enemies are a lot of fun to fight because they stand no chance against a good player. You will be able to easily block and dodge every shot and then cut them apart piece by piece without much trouble. If you're skilled with blade mode, you can cut projectiles in half as they approach you. You get to fight robot dogs with chainsaws, cut apart flying helicopters, throw giant robots and run down the side of a building and somehow the game doesn't feel stupid. Running vertically down a building while avoiding missiles. The level design is nothing special and the graphics aren't that impressive. Most areas have a brown and grey colour palette which doesn't change very much throughout the rest of the game. This is a game that is solely about fun gameplay, almost everything else comes second. This is fine because the gameplay genuinely is extremely fun and is worth buying just for that. Blade mode is responsive and easy to control. Platinum Games excell at making games that control well. Abilities are easy to use and the game has fairly deep combat systems that can be taken advantage of when you get better at the game. The move list is huge and controlling each one of them is easy. The controls are solid, aside from the obtuse blocking mechanic that requires you to point the analogue stick in the direction of an attacking enemy and press X/A. New players will likely struggle to figure out the block (one of the most important abilities in the game), but once you get the timing down you will make the game much easier. The sound in the game is nothing memorable, the voice acting is average and the lines are fine. The music is where this game REALLY shines. Each boss fight has a unique track that adapts and changes as the fight goes on, eventually adding in power vocals for the final phase of the boss fight when things get real. The songs are all really good and do a great job at hyping up the combat. Each mission has a rank at the end that is based on your time, combos and overall performance. S rank is the highest you can get and is what most people aim for, replaying the game on harder difficulties in order to get all S ranked fights or even the hardest Revengeance difficulty level can be reasons to revisit the game. The campaign is fairly short, clocking in at around 4-6 hours, this can make it a bit easier to come back to the game and play through it again quickly as there is no filler content and the game is very fun throughout. The combat is so good and fun that a lot of people will come back and play just so they can cut stuff up and listen to the music. Two DLC's were released which allow you to play as two different characters from the story. You are given most of their abilities which changes the game a lot when in combat. This game is great. The story and graphics aren't great, but they don't hurt the experience much as the combat is great. Platinum did a fantastic job and focused the majority of their effort on making the game feel stylish, fluid, exciting and really fun. Despite the length, this game is definitely worth playing over and over again. Verdict: 8/10, The story may be weak and the graphics are bland, but the gameplay, music and style of this game make neither of those things matter too much.